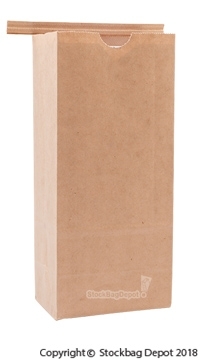 Paper bags have always been a popular choice for a more ecologically friendly packaging option. The recyclable aspect of paper makes these bags an attractive selection to environmentally conscious consumers. The available biodegradable PLA (polylactic acid) liner on some of these paper bags creates a completely green product that is both economical and effective. The pasted bottom of these paper bags means that the layers are adhered together which does not provide for an air tight seal. 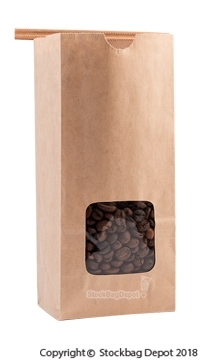 However, these bags are a popular option for take home products or fresh products that will be consumed quickly. The square bottom construction allows the bags to stand securely on store shelves and the factory applied tin ties give them a resealable feature that is a valuable marketing tool. Windows are also offered, allowing customers the opportunity to view products prior to purchase. Snack Foods, Bakery Products, Confectioneries, Coffee, Tea, Granola and various other applications.